Chinese New Year in Hong Kong is not unlike Christmas in the west. There is the tradition of giving gifts and feasting on food, as well as the custom of feuding with family members after being shut up inside watching old film reruns for a couple of days. While the roots of Chinese New Year are in the farmers harvest, these days CNY is a general excuse for celebration between family and friends. People spend their days on a regimental timetable of family visits, spruced up by the myriad of events and celebrations held around the city. Below are some of the main Chinese New Year traditions and customs in Hong Kong. Possibly the only time of the year that Hong Kong’s shops bring down their shutters, Chinese New year can play havoc with tourist itineraries, as much of the city goes into shutdown. During the official holidays for Lunar New Year, most shops are shut for the first two days. Many independent retailers will close their doors for the full week. Restaurants, bars, and clubs will be open and busy, as businesses look to snap up the tourist and expat trade. Most major tourist attractions will only close for the first day of Chinese New Year, while the city will also be home to a buffet selection of top-class events. Those traveling to China should be forewarned that Chinese New Year witnesses the world’s largest human migration and it will be nigh on impossible to get a seat on planes, trains or automobiles in the country. Outside major cities, the country will resemble a ghost town for a full week. Hong Kong is perpetually doused in a riot of color, however, with the onset of Chinese New Year the city is decorated in a fresh coat of red, gold and green. From skyscraper-sized neon signs to the red ribbons draped throughout the streets, the brightest and best colors come from Hong Kong’s flower markets. The big day for the flower market is Chinese New Year’s Eve when the city’s biggest flower market at Victoria Park will be swarming with people looking to pick up prize bouquets. The flowers are said to give good luck and are given when visiting family for the traditional New Years Eve feast of chicken and fish. In 2019, the Victoria Park flower market will run from January 30 to February 4, from 12 noon to midnight; on New Year Eve (February 5), the market runs from midnight to 6am. One of the more solemn duties of the Chinese New Year celebrations is for families to drop into their local temples. Tradition holds that the first three days of the New Year are the best time to visit temples, ideal for currying favor with the deities inside and bring luck for the year ahead. Traditionally families pop into the temple on the mornings of the first and second days of CNY. 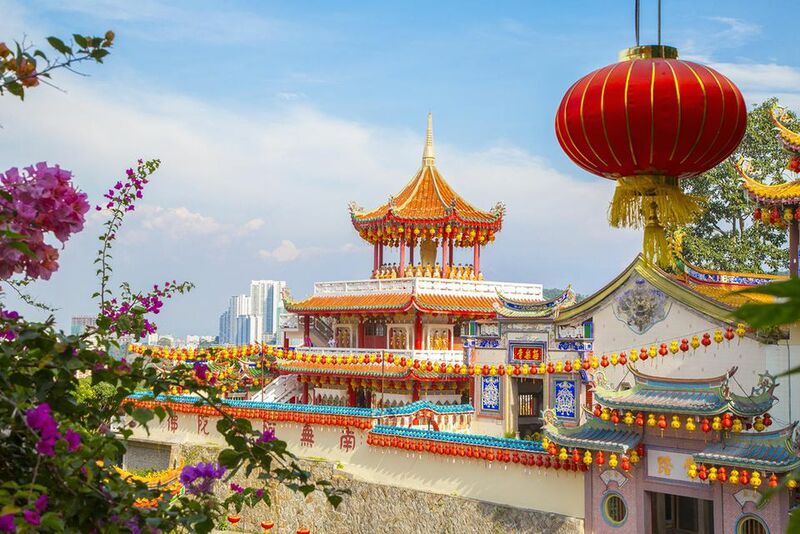 Even if you don’t want to bag some luck for the year to come, Hong Kong’s temples are one of the best places to see Chinese New Year in action. The intense mixture of noise, smells and sights is intoxicating, and without formal services, people are free to come in and look around. You should, however, be sensitive to photographing worshippers. Chinese New year sees the city go into a frenzy of present giving, from workers receiving their bonuses to the handing out of Hong Kong’s iconic Lai See packets. If you’re staying at a hotel for a prolonged time, or eating repeatedly at the same restaurant, your waiter and doorman would certainly appreciate some Lai See, otherwise, you won’t need to get involved. Find out what Lai See is and how to give it in this Guide to Hong Kong Lai See. Hong Kongers spend the first two days of New Year to see relatives. Traditionally, folks spend the first day visiting paternal relatives, and the second visiting relatives on their mother’s side. On both days, you’ll see whole families out and about in their newest clothes, resplendent in traditional New Year colors like red and gold. Day three of Chinese New Year is not the day to see the in-laws. Known as “red mouth” day, it's said that any encounters with family will be rewarded with bar room brawls and arguments. A better alternative for the third day – one that many Hong Kongers take – is to try their luck at Sha Tin Racecourse, where the Hong Kong Jockey Club holds the year’s biggest equestrian party during Chinese New Year. The winning horses take home the Chinese New Year Cup.